Anna turned 40 the year I was born. She had given birth to six children in eight years. She had buried her first born son just days before his fourth birthday. When he died the twins, a boy and a girl, were a month old. Her second son not quite two years. Another son arrived the same week that second son turned three. The twins were just learning to walk. At least one miscarriage, maybe two, before I arrived. She was tired. All the four older siblings had whooping cough. She had had too little sleep for months. I started having cramps soon after birth, probably caused by brain hemorrhage. Four months of constant worry, mingled with prayer for her youngest child. Then she could take it no longer. Vieno, a young girl, had volunteered to help her care for us children. One day she saw me all blue in the face and cried out. Mother came running. Now this had to stop. It was the last time too. But mother was exhausted. She had to go away and get complete rest. Vieno stayed on to take care of five small children, all under six years old. She wrote a letter to Anna. The four older children ‘wrote’ their own letters asking when mami is coming home. This entry was posted in Lesson 7, Uncategorized and tagged cramps, last time, old, tired, whooping cough. Bookmark the permalink. Your stories are always amazing recounts of such strength of your mother and her children. You have told this very effectively in such short sentences. Thanks for your kind comment. I have too much material in the way of letters and articles written by both my parents. The ‘concentrated version’ is a way for me to try to find the ‘essence’ of the story. 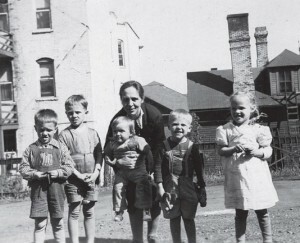 I hope eventually to publish a book about my missionary mother – on her seven-year journey traveling around the world with five children. This would be a wonderful memoir as the experiences in different countries are so interesting in the examples you have described. I hope that the start you have made continues. I am sure your siblings would also have much to add. I love how she is bending down to be a part of the group of children. She obviously did this very thing in her heart as well. So inspiring! One of my brothers has a fantastic memory. He has written down details which are a great help when I am trying to piece together the mosaic of our family’s life. My mother wrote many letters to her family – which give a clear time frame. My father wrote for a mission magazine – and home to us too when we were apart, so there is no lack of material. The problem is trying to sort it all out – so as not to bore readers! I think once you have your structure, it will all come together. Phew a lot to digest and recognise. This course once completed will provide the necessary structure needed to bring this piece to fruition. My new book: ‘MISSIONARY MOTHER – Around the World with Five Kids’ will soon be available on Amazon. Wow, I am inspired. I just joined the course and did not even read the first lesson. Congrats. No idea what I am doing or what I will write about my life but I am inspired by you and your mother’s story. I’d love to know how your story develops. I did the course about two years ago. It really gave me a kick-start for my writing! Good luck on your writing journey.